While all of our cells need glucose (a form of sugar which is turned into energy), cancer thrives on a body full of simple carbohydrates (which become sugar in the body) and refined sugars that come from processed foods and overly sweet goodies. If you or someone you know is suffering from cancer, one of the best things they can do is take away the disease’s favorite food – sugar. The German physiologist, leading biochemist, medical doctor, and Nobel laureate was convinced that you could starve cancer right out of the body. While it may not always be that easy, this is something that could significantly change the game. His theory was that malignant cells and tumor growth was caused by cells that generated energy via adenosine triphosphate (ATP) through a nonoxidative breakdown of glucose (sugar). The recycling of the metabolite from this process called glycolysis and the circulation of adhA back into the body caused anaerobic respiration. This is the reverse of what happens with healthy cells. Healthy, non-cancerous cells generate energy for the body to use through the oxidative breakdown of pyruvate, the end product of glycolysis, which leads to oxidized mitochondria. He therefore concluded that cancer was really a mitochondrial dysfunction. The normal process of respiration of oxygen in the body is changed to the fermentation of sugar. If you remove the sugar, the body should not develop cancer. The connection between sugar and cancer development is certainly not new. Most people can easily remove the obvious culprits that are full of refined sugar – cakes, candies, cookies, etc. The problem is that many foods which are packaged and sold in the US and in other countries are full of refined sugar, but just very sneakily hidden in the packaging labels. Things like ‘healthy’ yogurt, cereals, whole wheat or whole grain breads, and even ‘low-calorie’ items can be full of sugar. The easiest way to eliminate unwanted refined sugars is to stop buying ‘convenience’ or pre-packaged foods, and at least temporarily, don’t eat out at restaurants – many dining establishments source their food from big companies that ‘season’ their food with lots of sugar and salt to make it more palatable after being frozen and shipped across the country in trucks. Even salad dressings can be loaded with sugar. To deal with cravings for sugary foods, increase your plant-based and healthy animal based proteins (no red meat) and eat more nutrition-packed foods. I removed dairy, sugar, and meat from my diet, in addition to metaphysical work that restored my biology from stage 3 cancer without prescribed chemo ‘and’ radiation therapy. Recently they have found that high blood sugar levels are implicated in tumour growth. They are giving the diabetes drug Metformin to some cancer patients, which drug tells the liver not to produce so much glucose. It’s thought that Metformin also prevents some cardiac events and perhaps pancreatic cancer in diabetics. The real culprit is insulin. Having a high insulin level is not good, and you get high insulin levels due to insulin resistance and a high carb intake. One solution is exercise for insulin resistance, a low carb South Beach/Mediterranean diet. Careful with alcohol and high fructose fruits. No honey, dates, figs dried fruits as they are concentrated sugar. Just have to give up sweets, breads and other carbs. You don’t need them. This is absolutely a VERY important issue for all of us who live in the industrialized world! Refined sugar IS definitely a poison for our celluar health if continously consumed over many years and it has incredibly addictive power for our brain. It can easily derail the biochemical and growth balance in most of our body tissues. Our craving for refined sugar is not only the most important factor in today’s obesity and diabetes crisis, it is even very conclusively a root cause for many cancer case histories. If you want to learn more about Warburg’s thesis and its application in Ketogenic diet, I recommend you to listen to this conversation between Dr. Mercola and Prof. Seyfried published in June this year… http://articles.mercola.com/sites/articles/archive/2013/06/16/ketogenic-diet-benefits.aspx or listen to the readings of Prof. Dr. Lustig of the University of California San Francisco on youtube. I personally decided to go for a low carb diet, I only eat natural (not refined) food and I don’t drink any sugared beverages anymore, only water, tea and some coffee in the morning. I purchased me a glucose meter to check my blood glucose levels from time to time even though I am not a diabetic because I know how easily sugar can be hidden in today’s staple foods. Big pharma has of course no interest in promoting dietary solutions for big civilizational ailments due to poor food qualities like the obesity and cancer crisis which is already long in the making. Read it could be as high as 15 times, but remember that particular source. But google it or do a search on pubmed or whatever. There is bunch of info out there. Either way one should educate oneself. And not read crap like this. Badly written! The process described either in its anaerobic or aerobic form to break down glucose is normal. And yes you need oxygen to break down fatty acids. But it can go either way for glucose. Both fatty acids and glucose breaks down to ATP in the end. Thats natural. And ATP is needed in cell respiration. One cannot live without ATP. And one cannot take away ATP. The body produces it even if you dont eat glucose. This story should be deleted! Mary, about what are you so angry? Do you work for the sugar industry or the American Cancer Society ? You are debasing the writings of others; but your own writing is sloppy. I would be interested to learn the real source of your anger. Are you the neighborhood shrink? I don't work for anyone. I am and old and tired retired person, a former journalist and teacher and currently a sometimes freelance writer. I'm tired of misinformation. I come from an era where reporting was expected to be accurate and edited by the publisher. In this case, none of that happens. My "sloppy" writing was originally written as one long comment. But this wonderful newsletter has a word limit, so I divided it into 3 parts. Actually, it starts at the end. I did not write my comment to be published as a freelance piece but as a complaint. I am very much annoyed, not angry, at what goes for "journalism" or writing in general on the Internet, including this site. Since I wrote my previous reply to you, I have prepared yet another meal from a site shared by a Facebook friend. These amateurs who write recipes amaze me! They write such things as "one can of . . . " without saying the size. They write "One large bunch of basil." I need to know how much because it comes out of our yard. I prepare meals from scratch as much as possible because I'm trying to extend our lives. I worked once as an editor for a magazine that printed many recipes, many of which were written by chefs. They may be great cooks, but they can't write. I ALWAYS had to call them to verify things, and they thanked me. On the Internet all these people write things that no one oversees, and that appears to be the case here, too, all too often. Click my name for the real solution.. however only currently available here in China..
And yes – we also tell our cancer patients doing our treating to cut sugar out.. but it will not just kill the cancer just by cutting sugar out.. no chance… the body makes its own sugars by other ways once sugar is completely cut from the diet .. just not over done like most peoples eating habits are currently.. Yes, an overabundance of sugar is not healthy, but this article doesn't explain how your body can tell the difference between sugars. Yes, a lot of processed foods have too much sugar added to make them palatable and, yes, most yogurt is far from healthy. There is a link between too much sugar and candida growth. There is a link between eating too much sugar and ill health in general. A link. Strangely written articles like this make reasonable people turn away. Let's talk instead about methylation, glutathione, dehydration and toxic loads instead of demonizing certain foods. I believe Dr Hulda Clarke discovered that it is parasites (Faciolopsis buskii) that work in cooperation with the Isopropyl alcohol. That being said, what we did for my 80 yr old Father who had stage four cancer, is just add a little baking soda to honey say a half teaspoon to a small honey bear half full of honey and let it swell for 1 or 2 hours. Then we would give him a teaspoon right before a meal. This way the parasites go after the honey and the baking soda kills the parasites. They gave him 2 weeks to live a year ago. He has been doing wonderful. And which big company do you work for Mary? Really poor information this article is. 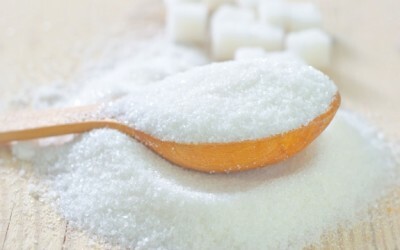 White sugar is a major cancer contributor because … it is processed using Isopropyl Alcohol, as a bonding agent. Isopropyl Alcohol also goes by the names, Isopropynol, Propyl Alcohol, and Rubbing Alcohol. Hulda Clarke, Phd. stated in her books about cancer that all tumors contain this chemical, and that it is in most body products, cosmetics, and many food 'products'. Natural Honey and molasses however, do not contribute to cancer growth, and also provide the body with several essential nutrients. I do not have a pony is the race of making profits from sugar. I am a 78-yr.-old cancer survivor and incessant reader. No box of processed food is "full" of sugar. Please make your articles accurate and research-based. This is nothing but yellow journalism. Your writer should advise us to learn how to read labels on all processed and packaged foods. And instead of advising us not to eat at restaurants, she should tell us to become proactive and inquire about ingredients in various dishes. The wait personnel won't like this nor will the chefs, but we can educate them to get used to it. The writing here is juvenile! She writes, ". . . cancer thrives on a body full of simple carbohydrates . . . " What does THAT mean? She credits the information to a Dr. Otto Wartburg. WRONG spelling. It's "Warburg." His time on earth was October 8, 1883 – August 1, 1970. Surely, more research has occurred since he left this earth. She mentions ". . . processed foods full of the stuff. . . " She refers to many foods as being "full of sugar." She says, "Even salad dressings can be loaded with sugar." To me, also a freelance writer/journalist, this type of sloppy writing is inappropriate in a publication that seems to be making an effort to educate the public on healthful living. Yeah, Otto Wartburg????? Too funny. Still, Warburg was right about his basic theory that cancer grows in the absence of oxygen, and that there is a point of no return where the oxygen gets starved enough of oxygen that cancer can grow. How that happens is speculation, but I like the theory that the cell walls get damaged from toxins so that the oxygen can't permeate the walls, and this lays the groundwork for fungus, which feeds on sugar. So sugar wouldn't be the cause, but it would be fuel. I find both your headline and story misleading and badly written. This topic is important, and the writer/editor should convey only valid information about it. Simply re-writing claims from various other websites is unprofessional and harmful. The notion that eliminating sugar can "starve" cancer is only a theory that has been explained and refuted by many reliable sources. Thanks for your reply. I don't know if you noticed that I have 3 comments on this story. I had originally written only one, but this website has a word limit, so I divided my one comment into 3. The way they ended up on this site, the sequence is upside down. I don't know the causes for cancer. As a cancer survivor (so far), I have read many research papers both in medical journals and on "pop" websites, and there is not a conclusion about sugar, just as there are no conclusions about anything except perhaps tobacco. Just read the other comments here–I am not alone. My main beef with this writer is that she says various products are "full of" sugar. I question her sloppy writing and I question the owners of this website who allow it. I looked up the author on the Internet and learned that she is a yoga instructor in Texas.